If you are a member of SULF, income insurance is included in your membership. 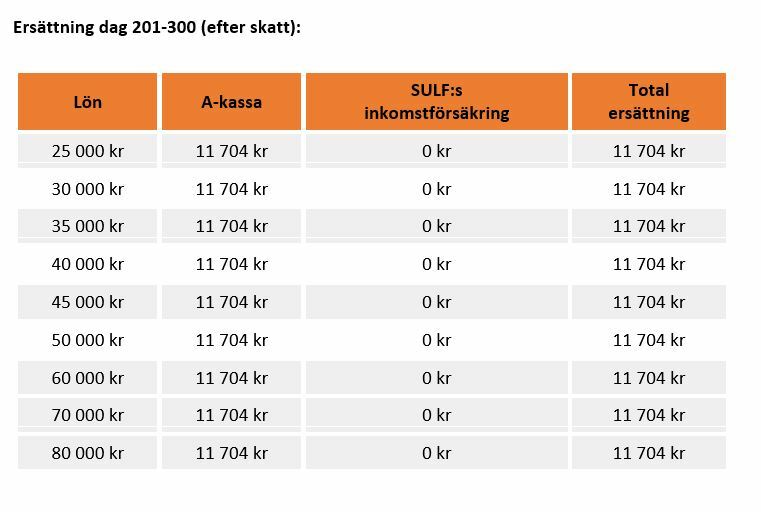 In order to receive this benefit you must be entitled to income-related benefits from Akademikernas a-kassa, AEA (or other Swedish a-kassa) so you need to be a member of both SULF and AEA in order to take advantage of this insurance. This insurance scheme is particularly suited to the challenges SULF members encounter in their academic careers. In the other income insurance schemes, periods on scholarships or full-time doctoral studies with no employment position cause problems, but we have anticipated these situations and you are able to disregard certain periods which improves your chances of receiving benefits. We also maximize your potential to combine support from the Job Security Foundation with SULF income insurance. For example if you are entitled to 44 days of benefit from the Job Security Foundation, you can then carry on with all 150 days of SULF income insurance. Career coaching is included in the SULF income insurance. It is available if you are unemployed and receiving compensation from the SULF income insurance. Read more here. To qualify, you must have been a member of both SULF and a-kassan for at least 12. months. The income insurance is not valid if you choose quit the employment. Included in your SULF membership. No registration or extra charges. Tops up Akademikernas a-kassa (AEA) benefits so you receive a maximum of 80% of your salary up to a monthly salary of SEK 80 000. Benefits are paid for a maximum of 150 days. Benefits are paid after a waiting period of seven days of unemployment. Qualifying period 12 months as a SULF member. For you to receive these benefits you must be eligible for income-related benefits from AEA so you must have been a member of AEA for at least 12 months. Read more on the AEA website. If you are not a member we strongly recommend that you immediately become a member, apply for membership here. If you are entitled to financial support from the Job Security Foundation or equivalent, these benefits must be used up before you can claim benefits from SULF income insurance. If you are covered by more than one income insurance, choose which income insurance that will apply to you. You may only receive benefits from one income insurance scheme at a time. This means either topping up from the Job Security Foundation or SULF income insurance or some other income insurance you are entitled to. • You must have been a member of SULF for at least 12 months at the time you become unemployed. If you, without a break in cover, changed to membership of SULF from another union, your membership period there will count as qualification time. Any questions before or concerning your change of union? Contact the SULF Membership Register. • You also have to have been a member of Akademikernas Erkända Arbetslöshetskassa (AEA), the unemployment insurance fund, for at least 12 months at the time you become unemployed. • You must have been granted income-related unemployment benefits by AEA. • You must continue to be a member of SULF and AEA during your unemployment period. • Your unemployment period must have begun after 1 January 2015. • You must not have been unemployed (i.e. received unemployment benefits) during the last 12 month period before starting a new benefits period. • Your options for topping up of unemployment insurance from the Job Security Foundation must have been looked into and, to the extent you are entitled to such benefits, been paid. • You may not be receiving benefits from any other income insurance. Members who are unemployed and receiving benefits from SULF’s income insurance may also receive career coaching. This service consists of individual assistance from certified coaches, a documented action plan and participation in different seminars. More information is available here . You can also upload Product sheet – Career Coaching (PDF, in English). • The first six days are a qualifying period under the Unemployment Insurance Act. No benefits are paid for these days. • You can never receive more unemployment benefit than 80% of your previous income. • As a full-time unemployed person, your benefit period is 300 days, but as a part-time unemployed person, benefits consist only of 75 days. • You are taxed on unemployment benefits from the unemployment insurance fund and the Job Security Foundation. A deduction corresponding to tax to be paid is also made from SULF income insurance payments. • Benefits are paid for a maximum of 5 days per week. • Benefits are paid in arrears. Unemployment benefits are paid after you have submitted your card to the Akademikernas a-kassa, AEA. SULF income insurance is paid after you have submitted your payment notifications from AEA. Processing period is approximately 5 days in both cases. It always feels good to be able to get an idea of what the benefits from Akademikernas a-kassa, AEA, and SULF income insurance will mean in your case. Although it is not possible to provide an entirely clear answer, we explain here how the benefits system works, and how much you are likely to receive if you became unemployed. 1. The Unemployment Insurance Act. 2. The unemployment insurance fund’s assessment of your eligibility for income-related benefits. 3. Cover provisions for SULF income insurance. The Unemployment Insurance Act stipulates that the highest level of unemployment benefits and statutory provisions that you can ever receive as no more than 80% of your previous income. You may receive a maximum of 80% in benefits for the first 200 days only, then the benefits are reduced to 70% of your previous income. However, benefits from the unemployment insurance fund apply only up to a certain ceiling which is why most SULF members need SULF income insurance or topping up of unemployment insurance from the Job Security Foundation in order to come up to about a maximum of 80% or 70% per cent of their previous incomes. For more information on benefits from the unemployment insurance fund please visit the AEA website. SULF income insurance is paid for 150 days. It tops up your income-related benefits from Akademikernas a-kassa, AEA, and means that from the two systems together you receive up to approximately a maximum of 80% of your previous income. A precondition for receiving these benefits is that your entitlement to benefits from the collectively-agreed topping up of unemployment insurance has been explored and utilised. So what are the benefits in practice? It always feels good to be able to get an idea of what benefits you will receive, but unfortunately it is impossible to give an absolutely certain answer. Tax rates vary depending on where you live and all benefits are based on an individual assessment by AEA. In order to at least be able to give you a rough estimate of benefits levels, we have compiled the tables below. A standard tax rate of 30% has been used regardless of salary level. Members can now take out an individual addition insurance policy on top of the basic insurance cover that is included in membership. This additional insurance must be taken out by each member individually and provides payments for an additional 150 days. 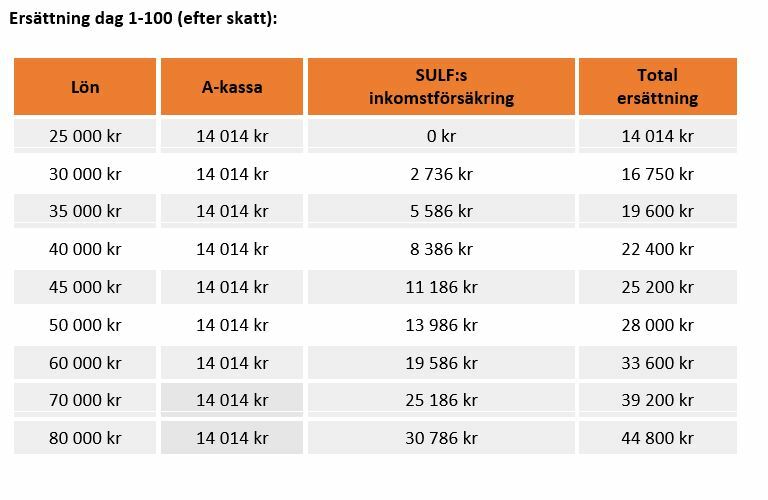 Monthly premiums vary according to income from SEK 33 to SEK 198. Read more! You will find the most frequently asked questions about the income insurance here. Below you can find the answers to the questions you are looking for. If you have further or other questions you are welcome to contact SULF’s helpline by email or phone 08-505 836 00 at 9.00-11.30.
add_circle 2. When are benefits from SULF income insurance paid out? They are paid out in arrears, after you have submitted your payment slips from AEA. Processing time is about 5-10 days. add_circle 3. How do I know if I am covered by the Job Security Foundation scheme, or some other collectively-agreed additional cover from the unemployment insurance fund? SULF has compiled information on the Transition and Job Security agreements within each professional area on its website. If you are a local government employee (including municipal and county council employees and private sector employees linked to PACTA) there is information on the Transition Fund. If you are an employee of Ersta Sköndal University College, Red Cross University College, the University College of Music Education in Stockholm, Stockholm School of Theology or Örebro Theological Seminary there is information on support from the Job Security Foundation. If you do not know what sector your employer belongs to, here is a list of colleges/universities with links to the relevant agreement information. add_circle 4. I don't know if I am entitled to benefits from the Job Security Foundation but I want to apply for benefits from the SULF income insurance. One prerequisite for being able to obtain benefits from SULF income insurance is that your eligibility for benefits from collectively-agreed additional unemployment insurance has been explored and exhausted. If you are unsure whether you are covered by the Job Security/Transition Agreement/other job security agreements, please contact your previous employer/s for information. Or get in touch with the Job Security Foundation (if you were a government employee). If you are still not sure, contact the SULF Membership Helpline and we will help to sort out your queries. add_circle 5. I am qualified for support from the Job Security Foundation but have only received the minimum number of days of topping up of unemployment insurance benefits. Will I lose these benefit days from the SULF income insurance? No. Topping up by the Job Security Foundation in the form of benefits via the Job Security Agreement/Transition Agreement must always be used up before you are entitled to support from SULF income insurance. If you are entitled to 44 days of benefit from the Job Security Foundation, when they are used, apply for benefits from SULF income insurance. SULF income insurance gives you the opportunity for up to an additional 150 benefit days. add_circle 6. I recently became a member of SULF so I do not fulfil the 12 month membership requirement. I was previously a member of another union with collective income insurance, does that count? Yes, the time as a member of another union income insurance scheme will be credited as qualification period if you switch to SULF membership with no gap in between. If you have any questions, contact SULF:s membership service. add_circle 7. What applies for me? I have double membership in two unions? If you have dual membership, you can choose which income insurance is to cover you, but you can only receive compensation from one income insurance policy. You do not need to pre-register which income insurance policy you intend to choose. You make your choice if you become unemployed and need to make an income insurance claim. The terms in the income insurance policies differ, for example when it comes to number of compensation days, ceiling amounts and postponement of payments. It is therefore important that you yourself decide which income insurance you wish to use. If you have signed a supplementary insurance through your other union, you should choose income insurance from that union. add_circle 8. I am SULF member and have joined the Saco income insurance scheme. What should I do now?? The terms and conditions between the two insurances are different. The SULF income insurance is included in the membership, and Akademikernas inkomstförsäkring is a individual insurance which you will have to pay extra for. 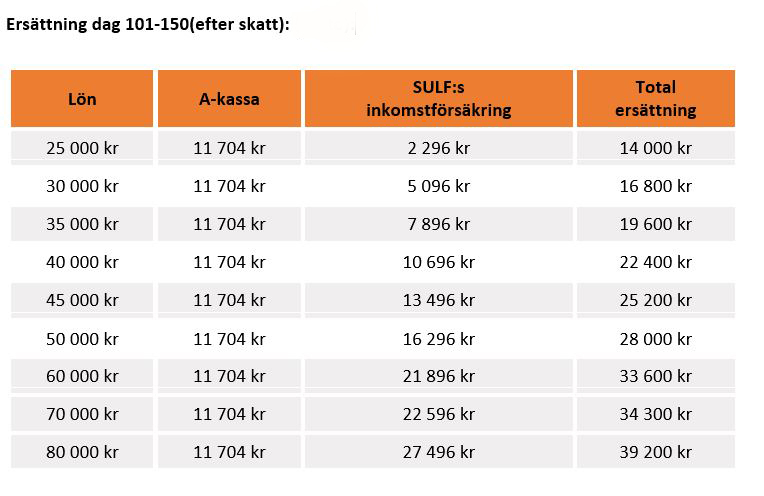 Akademikernas inkomstförsäkring gives you compensation for (240 days and SULF’s 150 days) but the ceiling is equivalent of a monthly salary of (50 000 SEK and SULF’s 80 000 SEK). If you fullfill the claims for compensation from SULF’s income insurance you should consider to cancel your individual income insurance. add_circle 9 My doctoral candidate employment ended before I finished with my doctorate. Am I entitled to compensation from the income insurance? As a doctoral candidate, you are simultaneously an employee and a student, which means that in order to be able to receive compensation from the unemployment insurance fund, you not only need to be without employment, but also need to have finished or interrupted your studies. Finished means usually that you have received your doctorate, but AEA may consider that your situation is comparable to having completed your studies if, for example, you have submitted your thesis and the only defence remains. If you have not finished or interrupted your studies, you are deemed to be not available for employment and are therefore not entitled to compensation. The SULF income insurance applies AEA assessments regarding your right to and your level of compensation. Read more about compensation following employment as a doctoral student. SULF income insurance follows the AEA assessment of your entitlement and your level of benefits. Read more about benefits after employment as a doctoral candidate. add_circle 10 I am a doctoral candidate but do not have an employed position. I am just about to graduate – what applies for me? In order to get benefits from the unemployment insurance fund and SULF income insurance, you must qualify for income-related unemployment benefits. This means that you, in addition to 12 month membership of both SULF and AEA, must have been employed for at least 6 months during the last 12 month period. If you do not meet these requirements, you can unfortunately not be paid benefits. If you had an employed PhD position but after this ended you chose to finish your doctoral studies without employment, this period without employment can be disregarded if you were in full-time studies. If you are then paid benefits from AEA, you can also get benefits through the SULF income insurance. Read more about benefits after employment as a doctoral candidate. add_circle 11. I have been on parental leave for one year. Do I receive any benefits from income insurance when my employment ceases? Yes, if you meet the requirement of at least one year membership of SULF and AEA and the AEA grants you unemployment benefits after parental leave. If you have had an income in excess of the ceiling for unemployment insurance, you will also receive benefits from SULF income insurance. AEA will, when making its decision, assess whether your leave is discountable time, which it usually is. Read more about discountable time. add_circle 12. I have been working in Sweden but now I will be working as postdoc in the US for two years on a scholarship which is the equivalent of full-time. What benefits am I qualified for if I am unemployed when I come back to Sweden? If you meet the requirement of at least one year membership in SULF and AEA and the AEA grants you unemployment benefits and you have had an income above the ceiling for unemployment insurance, you may also receive benefits from SULF income insurance. AEA will, when making its decision, assess whether your postdoc scholarship period can be discounted as it usually is. Read more about postdoc periods as discounted periods. add_circle 13. I have been working for a year abroad and have been granted benefits by AEA now that I am home again. Can I also get benefits from the SULF income insurance? If you have been working abroad, you may in some cases receive both unemployment insurance and benefits from SULF income insurance. If you have worked in another EU country and AEA takes a decision to count this period you may be paid income-related unemployment benefits. In addition to income-related benefits from AEA you must also fulfil all the other terms of the insurance. See also AEA information about what happens when you come back to Sweden from working abroad. Your citizenship does not effect your possibility to get benefit when your are unemployed, but you need to have the right to work and live in Sweden. If you have residence och work permit, you can, if you fullfill the claims for compensation from AEA as well as from Trygghetsstiftelsen or SULF’s income insurance. Read more! add_circle 15. Is income insurance valid in cases of illness? Income insurance is linked to unemployment and receiving unemployment benefits. Thus, income insurance is not paid when you are ill. Instead, topping up of sickness benefits will occur through collective agreements and any private insurance (health insurance, life insurance etc.). Members can take out an individual addition insurance policy on top of the basic insurance cover that is included in membership. This additional insurance must be taken out by each member individually and provides payments for an additional 150 days. 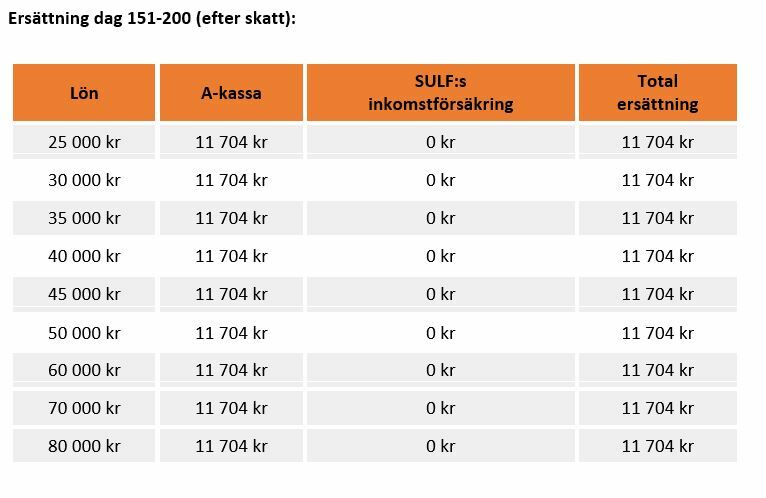 Monthly premiums vary according to income from SEK 33 to SEK 198. Read more here! 3. Contact the The Job Security Foundation and check if you are entitled to topping up of unemployment insurance. Read more about the 4 steps. To folksam.se and terms for the income insurance.